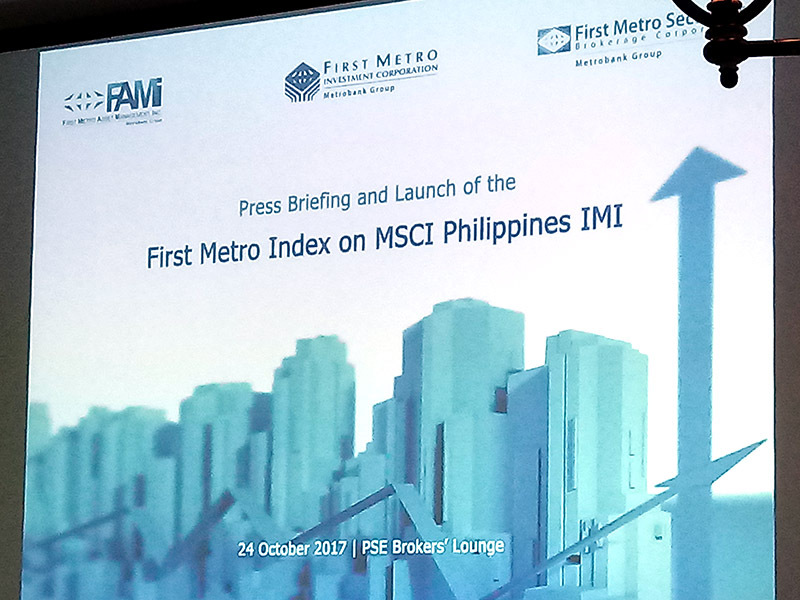 On October 24, 2017, the First Metro Investment Corporation and MSCI, Inc. officially launched a brand new customized stock index called the First Metro Index on MSCI Philippines IMI. First Metro Investment Corporation is a part of the Metrobank group and it’s one of the biggest investment banks in the Philippines. It has received several awards such as the Best Investment Bank of 2016 by Global Finance magazine and by Euromoney, multiple Best Bond House awards by FinanceAsia, and many more. Through their subsidiary, the First Metro Asset Management, Inc. (FAMI), First Metro partnered with MSCI, Inc. which is a world-renowned index provider that has over $11 Trillion worth of assets benchmarked to their indexes as of 2016. Now why is that important? 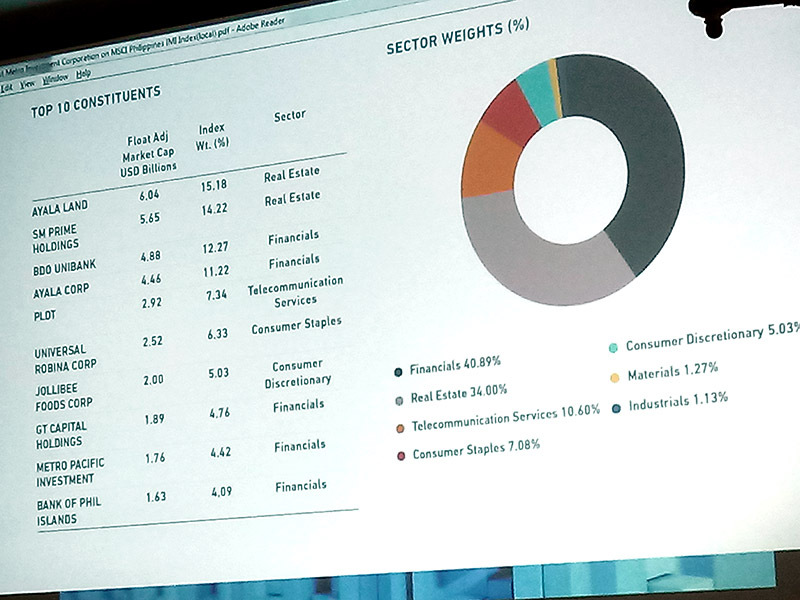 How can you use that new index to improve your investing strategy and investment portfolio? Well first off, let’s learn a bit more about indexes, mutual funds, and passive investing. *Note: I’ve edited this section and moved most of it on a previous mutual fund article. A mutual fund is an investment where a lot of people pool their money together to invest in assets like stocks, bonds, money market instruments, and many more. These are run by professionals called fund managers or money managers who actively invest the money to earn more money. If you don’t know how to choose good stocks, then invest with a fund (or an ETF, which functions similarly) and let professionals do it for you. Unlike most mutual funds, index funds on the other hand use a more passive style of investing. Instead of constantly buying and selling stocks to try earning more from stock movements, index funds tend to simply copy the market and they don’t trade as often. You usually won’t find these among the “big winners” reported every year, but here’s something you have to remember: “Index funds outperform approximately 80 percent of all actively managed funds over long periods of time” (The BogleHead’s Guide to Investing). What about the so-called “best funds”? You’ll often see actively managed funds advertising that they’re the “best”. Remember this: Past performance does not guarantee future returns. Just because a fund did well, that doesn’t mean it will continue to do well forever (or even in the short term). This year’s absolute best fund can become the worst loser later. Lots of financial professionals try to predict the market to buy or sell winning stocks and other assets, but the reality is that most of them FAIL. Even the top money managers can get it wrong, and they can get it wrong often. For example, Mark Hulbert (Hulbert Financial Digest’s editor) disclosed that the top funds, those with five-star ratings by Morningstar, failed to beat the market (1993-2000). The Wilshire 5000 (the market index) gained about 222% from 1993 to 2000, but the “top funds”, those who have five-star ratings, earned only around 106%. If you invested with them, you’d theoretically earn less than HALF what you would have gained if you chose an index fund that replicated the Wilshire 5000. Another example? Christopher Blake an associate professor of finance (Fordham University Graduate School of Business) and Matthew Morey, also an associate professor, published a study on Morningstar’s top funds from Jan. 1, 1993 to Dec. 31, 1997. What did they find? The five-star funds underperformed the market by almost 4%. What else did they find? The performance of five-star funds weren’t that much different from four and three-star funds. Aside from the underperformance of actively managed funds compared to index funds in the long term, one of the greatest advantages of passive investing in general is the lower costs involved. Just imagine two similar businesses with similar earnings, but one has much lower operating costs. The one with lower costs win, especially over the long term. Let’s apply that to investing. For example, imagine the market earns an average of about 6.5% a year and you invest P12,000 every year. A fund that costs 1.5% (thus you earn 5% a year) will eventually give you P1.45 million in 40 years. A cheaper fund that costs just 0.5% (thus you earn 6%)? You’ll end up with around P1.86 million. That’s an extra P410,000 difference by saving just one percent in fees. *A market or investment earning a consistent 6.5% a year is only theoretical of course. So what’s the lesson there? Instead of spending more in management and trading fees trying to beat the market and FAIL at it, it’s much better to simply follow the market and then save as much of its gains as possible through a low cost passive investing strategy. 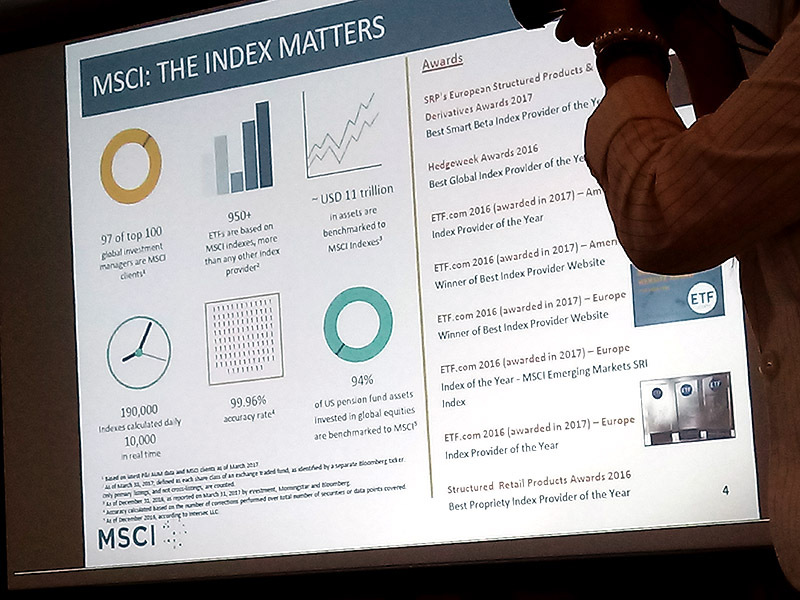 Now that we’ve learned a bit more about the advantages of passive investing, let’s go back to the First Metro Index on MSCI Philippines IMI launched last October 24, 2017 by FAMI and MSCI, Inc. Unlike normal equity indexes designed to match an entire market, this one is specifically customized to reflect the country’s family consumption theme. It’s composed of the stocks of 18 highly liquid and tradable companies heavily involved in the consumer sector (it’s not limited to GICS-classified “consumer” companies). So why create an index of consumer companies? The Philippines’ economic growth is driven mostly by the consumer sector. The increasing middle class population. The upcoming income tax reduction of the middle class. More take-home pay means more consumer spending. Those factors (among others) will likely lead to an increase in consumer spending and an increase in the value of the stocks of companies involved in the consumer sector. 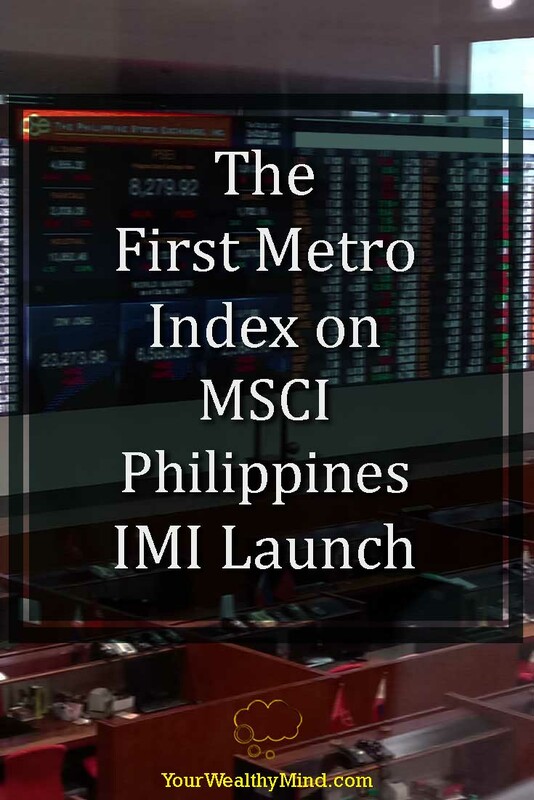 If you want to ride the growth driven by the consumer sector, then you can use the stocks in the First Metro Index on MSCI Philippines IMI as a guide and modify your portfolio accordingly. That’s not all though. Although there’s no exact date, the FAMI president Augusto Cosio said they might create a fund to mimic that index. If you want to invest in an index fund riding on the Philippines’ consumer sector growth, then that’s something you’ll want to watch out for. Like I said before, one great advantage of index funds is their low costs. Trying to emulate an index by buying individual stocks would likely cost you a fortune in broker’s transaction fees so if you want a well-diversified investment, an index fund is a good choice. A preview of the new index’s constituents. 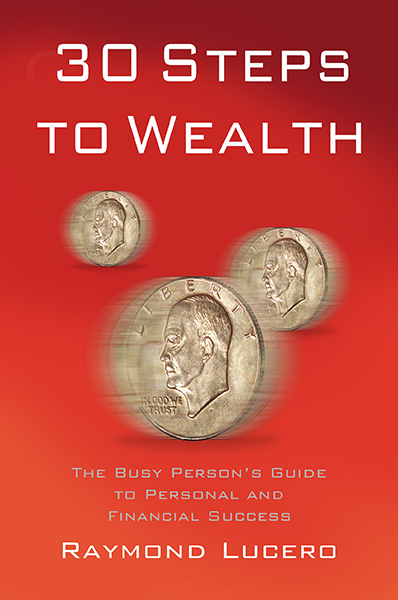 For now, however, do you want to learn more about personal finance and investing? Check out our book recommendations below!